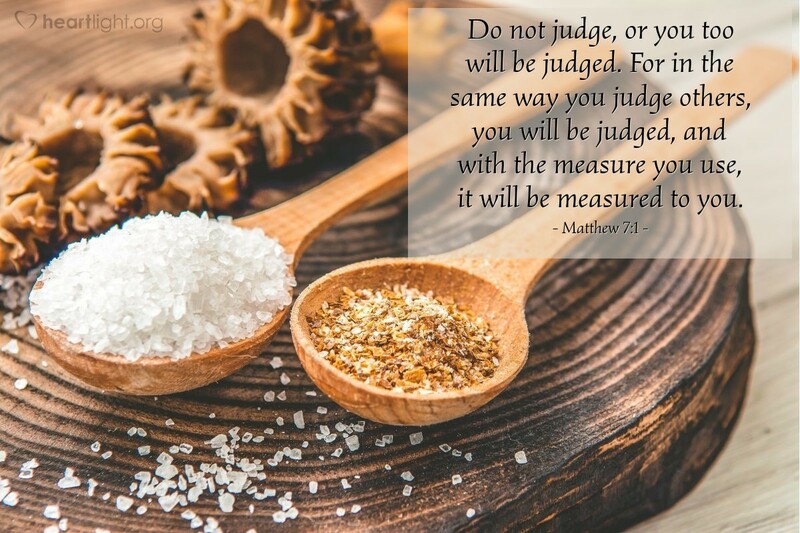 Are you judgmental? Do you assume you can judge the intent of another person's heart? Are you critical and negative about the actions of others? Jesus wants us all to realize that we cannot know the motivations of someone's heart. When we are unfairly harsh or bitingly critical in our judgment of others, we are setting the standard by which God will judge us. I don't know about you, but I'm not willing to exchange God's grace for my unreasonable harshness. I'm going work harder at viewing others with mercy and grace. Dear God, please forgive me for being unfairly harsh and critical in my assessment of others. Thank you for being so rich and free with your mercy and grace lavished on me in Jesus. Please help me to be more gracious and merciful in the way I assess the intent and motivation of my fellow brothers and sisters in Christ. In Jesus' name I pray. Amen.